Dave The Barrel Man is the largest barrel yard in the State of Texas providing a broad selection of metal and plastic barrels, industrial and food grade totes, and beautiful wooden whiskey barrels! 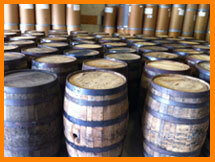 In addition, we are always looking to buy stocks of all kinds of barrels! Dave the Barrel Man Welcomes All Dealers! If you are in need of more information, please feel free to visit us at 811 Roosevelt or you may contact our office at 210-534-5416. Thank you for visiting Dave the Barrel Man!! !